March 30, 2015 at 11:42 am. As we present Part 3 of this seven-part series, we should remind ourselves of a primary concept: Every church is different. With this particular article, that’s especially true. In fact, the non-traditional worship space can be almost anything. So, what does a non-traditional worship space necessarily include? Some elements are universal: a room, a floor, some walls and a roof — sometimes with a ceiling. It includes seats (most likely chairs), which are oriented toward a central focal point in the room, generally a platform. Likely, this platform is elevated a bit and outfitted with musical instruments, singers and a preacher. You’ll typically find technical equipment such as a sound system, lighting, video and — depending on the size of the space — possibly an acoustical treatment on the various room surfaces. And of course, there are people in the room. So, what makes this a non-traditional worship space? That’s a good question — one which is best answered by two overarching elements. #1: The building structure in which the room exists. The structure that houses this kind of worship space can be almost any kind of building, but it won’t likely resemble the traditional church structure we investigated in Part 2 of this series. Rather, non-traditional worship spaces can occupy transitional spaces intended to support a growing church. In an existing church, this might be a multipurpose space. For a new church or a church-on-the-move, it might take the form of a repurposed school, grocery store, “big box” store, strip mall, or a stand-alone building. #2: Worship style. In non-traditional worship spaces, I’m optimistic that the message of the Gospel of Jesus Christ as presented in the Bible is clearly, concisely relayed by the preacher to those in the seats — typically in a less formal way. Terms such as “progressive” and “contemporary” have been used to differentiate this worship style. Yet, I believe these aren’t entirely effective and can even lead to unnecessary discussions based on personal preferences rather than the worship for which the room was intended, for which the specific church was founded, and to which even this series is devoted: authentic worship of Jesus. One of these non-traditional room types — the multipurpose room — has gained popularity for its flexibility and cost-effectiveness. 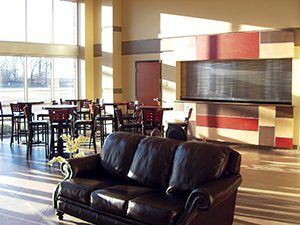 Worship spaces, gymnasiums and fellowship halls are found on many church campuses; the combination of these elements can simultaneously support multiple ministry options. Multipurpose rooms can take on the image of any element of its use based on the ultimate, long-term intended use. Or, it can transition from one use to another as dictated by the needs of the church over time. 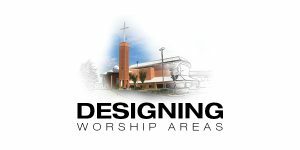 Download the “Designing Worship Areas” eBook! We have found multipurpose worship spaces to be particularly beneficial to church clients undergoing renovation. That’s because these spaces support multiple ministry events while also functioning as worship venues. Even so, the worship area’s aesthetics don’t necessarily need to resemble a gymnasium. Rather, they can be conducive to the acoustical needs of a worship space while supporting the needs of a gymnasium or a fellowship hall. These rooms can even accommodate breakdown into smaller rooms to support conferences and other small group needs. 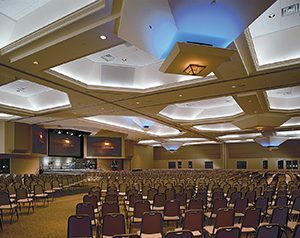 Although there are technical challenges inherent to a multipurpose room which are different than a more traditional worship space, these can be overcome with a qualified technical consultation. For new churches or churches in transition, financial capabilities and stewardship concerns favor a multipurpose format for the worship area compared to a single, dedicated room for this purpose. Most of all, this approach enables ministry dollars to drive ministry, not debt. We have established that worship areas come in many shapes and sizes. Yet, the goal should always be the same, whether this space is traditional or non-traditional, housed in a repurposed grocery store, or a transitional multipurpose room or a multifunctional room for a larger church body. That goal is to worship Jesus. What better purpose can there be? Curtiss H. Doss, AIA is principal of McGehee Nicholson Burke (MNB) Architects in Memphis, TN. Doss has consulted with church clients for more than 20 years, and his architectural practice spans more than 30 years.